...that The Speaker went missing during The Red War? "…found them… Crystal Orchards of Dione… requesting backup… coordinates to follow…"
Chromatic Fire is an Exotic chest piece introduced in Forsaken. 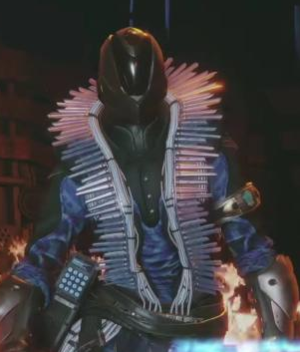 This armor creates elemental explosions on any enemies killed by its wearer's precision kinetic kills. It was Wen Jie who told me. At first I didn't believe her—I mean, it's Wen Jie; she believes in moon fairies and the continent of Antarctica—but she showed me the crystals. I examined the lattices myself. The crystals hold no natural attunement to any one fundamental force but, when exposed, achieve perfect fundamental force conduction. She told me she got them from a trader at the Seven Stars, who got them from a Hunter, who got them from a Frame, who was programmed by a family in the Umbral District who had passed down the crystals as family heirlooms for generations, who'd been given the crystals by a Guardian back in the Dark Age in exchange for a home-cooked meal. The name Pergamon never turned up. But where else could these crystals have come from but the Crystal Orchards of Dione?